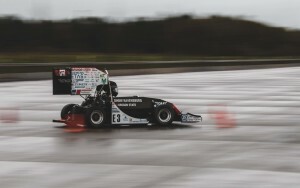 On Easter Monday, the team started the eCar testing season with a driving day in Leipheim near Ulm. For many team members, this was the first testing session ever, so one of the main goals was to get used to testing processes and tasks. In the early morning we met at the shop and prepared the good old GFR15e, which has not driven for about a year. After loading all necessities into the trailer and private cars, we made our way up to airfield Leipheim, where we built the track and got the car ready to drive. In the morning driving session, our potential 2017 eCar drivers Rainer and Andre made lots of kilometers on the oval-shape track. Whilst Rainer has two seasons of driving experience already, it was Andre’s very first time driving the car. 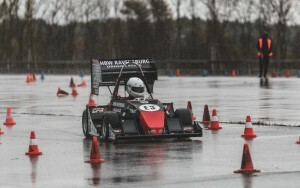 Even though it was raining almost for the whole day, causing a wet track, the car felt like running on rails even in the slalom section. While charging the battery, everyone was quite hungry, so we got our lunch and had some nice chats. Marco, who will drive at competitions this year as well, started the second driving session by making 10 fast laps. 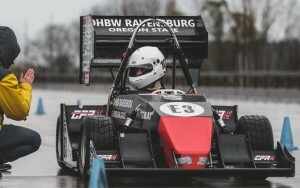 We used the remaining battery charge for all of our attending third-year students, who have not driven the eCar yet, to have some fun on the track, which they obviously had! On this long, wet, but very exciting day the team gained lots of experience, which is necessary for all the upcoming testing days. We cannot await finally seeing our new GFR17e driving!